If you went to eat dinner at the Preble Street Soup Kitchen on a Friday night in early March, you wouldn’t have too much to choose from. The menu was limited…Barber Chicken Cordon Bleu, wedge potatoes, and a carrot/bell pepper medley. Granted, I’ve had skimpier meals (and seen far worse at other soup kitchens in this country), but if you’re Muslim or Catholic (no meat during lent), Friday night’s options would leave you pretty much SOL. Guess beggars can’t be choosers… And those of us who like to pretend we have a disposable income spared ourselves the free meal and had pizza at Otto. 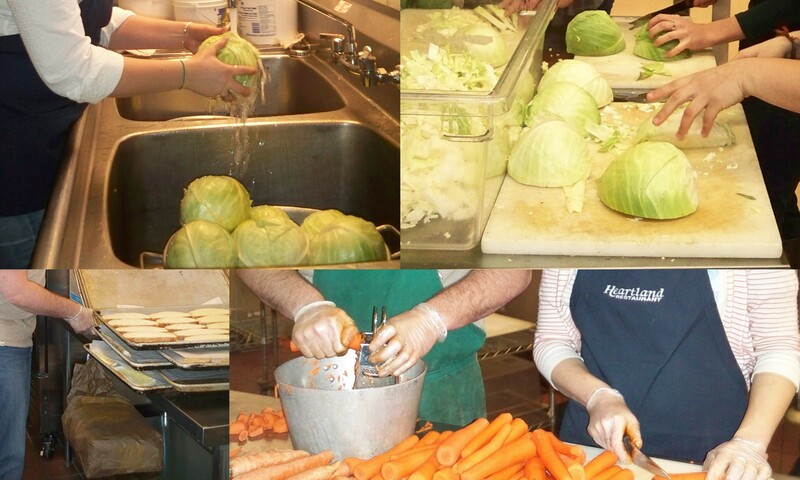 The volunteer experience was pretty much as expected…chop the carrots, chop the cabbage, butter the bread. I was there with a group of eight friends, so all that chop-chop-chopping was a fine opportunity to catch up from the week. The best part was our discovery of the bread slicer – that old saying about “the greatest thing since…” is around for a reason. It took two of us to turn the thing on, push a loaf of bread through, and pull it out the other end without losing any fingers – but it was completely gratifying! No more 2″ thick pieces of bakery bread, my friends. As 6 o’clock approached, Lizzy (the kitchen manager) divided us up into different jobs for dinner. I was in charge of the mixed veggies, which turned out to be the least desirable dish. I tried to force the cold carrots and bell peppers on to one of the few kids in line, but she avoided me like the plague. All in all, everyone was quite friendly – there were lots of smiles and “pleases” and “thank yous”. Quite a fine group of people, if you ask me. Now, here is where things got relatively interesting (or at least if you are a community service nerd like me). Preble Street recently took over the dinner service from Wayside Soup Kitchen. Both organizations have different ways of pulling off the soup kitchen thing, and we had a hot debate over the best method. Was the new Preble way better, where clients have a choice of dessert but have to stand in line for us to slop everything on their plate? Or do they enjoy the old Wayside method of serving everyone while they sit waiting? Was it better to have volunteers interact with clients or maintain a solid routine? Do the clients want to be treated as guests or have control over their serving size? Ultimately, I don’t think we reached any grand decision as to the best way to serve the hungry, but it was an interesting debate nonetheless. So, in the end, the evening was pretty uneventful – just a few friends hanging out at the soup kitchen. We hadn’t been terribly impressed by Lizzy’s management skills, but as we were leaving she thanked us about 100 times, saying we were the best group of volunteers EVER (so what if she’s only been doing it a couple weeks). That gratitude alone was enough to make me want to go back, roll up my sleeves, and paint some butter on day-old bread.